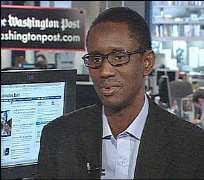 In 2003, Nuhu Ribadu, a bookish police officer with a legal degree, became head of the Economic and Financial Crimes Commission of Nigeria. His job was to investigate corruption -- a problem that Ribadu estimates has cost Nigeria more than $380 billion since independence in 1960. One of Ribadu's first moves was to go after the Nigerian scams that duped e-mail recipients around the world into get-rich-quick schemes. He went after dirty politicians, too, helping Nigeria recover more than $5 billion in stolen assets. But Ribadu went too far. After charging a powerful state governor with corruption in December 2007, Ribadu was removed from his post. After two attempts on his life, he fled to Britain in September. Last week, Ribadu sat down with Outlook editor John Pomfret to talk about Africa, corruption and trying to stay alive. Excerpts: How bad is corruption in Africa? It's a massive problem. $140 billion -- that is the African Union's estimate of the cost of corruption to Africa annually. This is about 25 percent of total GDP in sub-Saharan Africa. It is the reason why Africa is Africa today. Not long ago, we were at par with several other parts of the world. Today we are really decades away, and it is certainly because of corruption. You investigated and prosecuted your own boss, Tafa Balogun, the inspector general of police. This is a gentleman who was in charge of law enforcement. We got as much as $150 million that he was keeping in terms of money and properties. How much does a police officer make per month in Nigeria? The average I think, maybe maximum $200. So how did you get him? We had a reporting system whereby transactions above a certain threshold had to be reported to us. And we saw this policeman with a billion nairas [$1 = 150 naira] in his account. And that's what triggered the investigation. You also investigated governors of Nigeria's powerful states. One was a governor of a state called the Delta state, Nigeria's oil state. And we saw this guy who was rich with probably $700 million. And I brought him to justice. He gave me money -- this gives you the picture of the problem of the country. He gave me $15 million, in physical raw cash, to stop the investigation. Of course he did not succeed. We took the money and charged him for it. Is he in jail? When I was in office. What is he doing now? He is a huge person in politics. He is the biggest one in the ruling party. He just bought a new jet. In recent months allegations have surfaced of corrupt and otherwise illegal business practices by Western business in Africa. The U.S. oil firm Halliburton agreed to pay $559 million to settle U.S. corruption charges linked to its former subsidiary KBR in connection to a scheme to bribe Nigerian officials for construction contracts. A civil case in New York accuses Royal Dutch Shell of complicity in the execution of Nigerian author and activist Ken Saro-Wiwa. How do Western companies figure into Africa's corruption? It is the real fuel, the real vehicle that moves the entire thing. They are where there are natural resources. And their money ought to go for the development. But it is not going. They are making money out of it, while the owners of these resources are not taking benefit out of it. Some countries in Africa refuse to allow pay-offs from businesses. Botswana, for example. They came up with a very transparent system with a very clear relation with [South Africa mining company] De Beers for diamonds. The money is invested openly and today Botswana is the only country in Africa that has gotten close to 100 percent of the value of its own natural resources. You've said that corruption is responsible for as many deaths as the combined total of HIV/AIDS and conflicts in Africa. Why? Three reasons. The reason for the total absence of health facilities is a result of corruption. No hospitals, no clinics, no trained personnel, no roads to the rural areas. The money ought to have gone for that, but it ended up in pockets of the rulers. Two, it's also responsible for the ignorance that is very common in Africa. AIDS is substantially the result of ignorance. And it's because the money that ought to have gone to education has been diverted. Three, in crisis situations, whether it is natural disaster or issues like AIDS, corruption makes foreign intervention impossible. Even if the world is desperate to So should the West stop giving aid to Africa? I think that is a little inhuman. If a dying patient is there, and you are applying medication, just because the body is rejecting it, you do not stop giving the medicine. Nigeria is famous for its e-mail scams. How did they begin? It started small at the time when we had difficulties as a country, about the mid-80s. We were almost at the point of a total breakdown, like a failed state. Local criminals started targeting people by way of letters and phone calls to cheat them. Then they moved into e-mails. Gradually, money started coming, from all over the world. How much money altogether was coming in annually? A billion dollars. So you went after them? I decided to send a clear message of change coming out of Nigeria, and also to send a signal internally that we cannot just continue like that.